As a developer we know that Visual Studio is best IED for application development but only for Microsoft Windows. Now days things are changing very rapidly and Microsoft also. They are opening their many platforms to open source community and in this they created one open source lite weight IDE named Visual Studio Code. 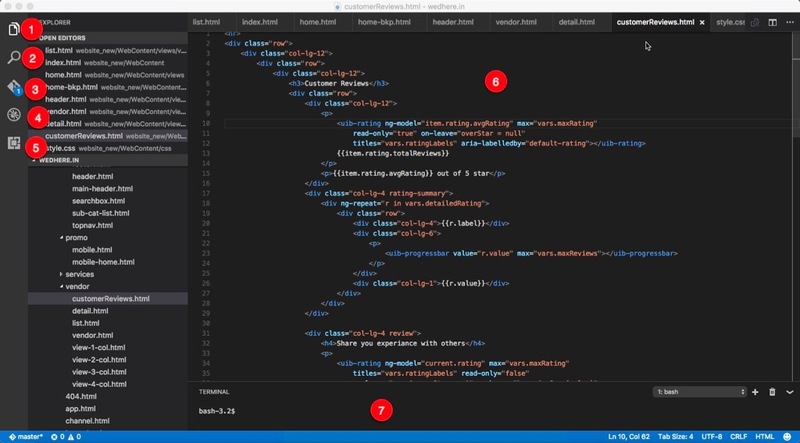 VS Code supports syntax highlighting for many programming languages, Markups and Scrips along with integrated terminal/console of underlaying platform. It also supports source repositories like Git. It’s architecture is plug-in based where people can create different plug-ins and publish it on centralize repositories. There are hundreds of plug-in avalable for designing, developing, dubbuging and testing applications of different platforms and framework. I personally use VS Code for Node.Js based application. Developing running and testing Node.Js application is very easy, just use it’s integrated console for all command execution. There is no project or solution file, you just need to open root folder of your application, it will automatically detect file type by extension and start highlighting respective syntax. This IDE supports many window mode, like Zen mode, split windows and it has hundreds of keyboard shortcuts. You can check all keyboard shortcuts of Visual Studio Code on this MSDN post. Apart from this it supports many other IDE’s keyboard mapping through extention and many are available on VS Code market place. Currently Visual studio code is avaibale for Windows 7,8,10, MAC and Linux. You can just start by downloading and installing it.